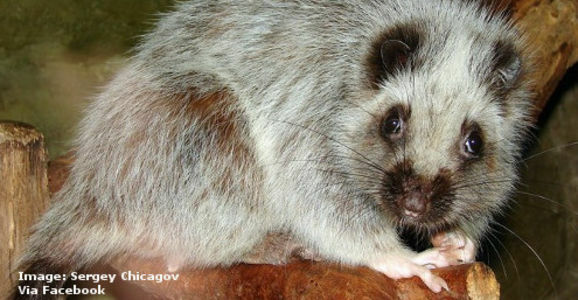 NOTE: The Dinagat bushy-tailed cloud rat is so rare that very few photos if it exist. The above photo is of the slender-tailed cloud rat, a close relative. If the idea of coming face to face with a rat gives you the heebie jeebies, you haven&apos;t seen the cloud rat - a cute tree-dwelling rat found only in the Philippines. All six species of the cloud rats are endangered but none are more endangered than the bushy-tailed cloud rat of Dinagat Island. The rodent lives in the forests on one island in the vast Philippine archipelago. But they are in danger, there are little local protections to ensure the forest&apos;s - and thus the rat&apos;s - survival and there are no national land protections on the entire island. Before 2012, the 2.5-foot-long critter had only been seen once. For decades it was thought to be extinct until researchers finally caught a glimpse of the brown rat with a black and white tail. News of its existence was welcomed and brought new hope the conservationists that the rat had a chance. But its survival isn&apos;t a sure thing.The island's forests are disappearing and those that are left have been claimed by mining companies who at any moment could begin excavation. If that happens the last remaining habitat for this unique animal could be gone for good. Conservationists are working with locals to help set up a nationally protected forest habitat on the island so the cloud rat can thrive. It is the only way to ensure that some of the island will be reserved for its four-legged inhabitants. Please join the call. Sign the petition and ask the Philippine government to do the right thing and set up a nationally recognized protected area so that the cloud rat, and other indigenous animals can live on.